Your guide to navigating the systems that have a stake in your health. Why You’re Here: You’re struggling to navigate the systems that have a stake in your health–health insurance, healthcare professionals, the newest gym craze advertising for your dollars. What’s Inside: We created this Toolkit to give you a new framework for understanding these systems and operating within them to get what you need. We don't know your specific circumstances, but this is a good place to start. 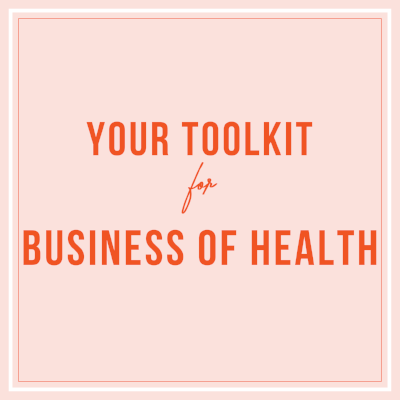 How To Use It: This isn’t a prescription, so feel free to take or leave the ideas we share depending on what your body is telling you and what habits fit in your life. Knowledge is power - find out your current health care options if you don’t what they are. Ask your employer, or visit healthcare.gov to see how you should enroll and what plan might work best for you. The more information you have then the more you can use them. Learn how to advocate for yourself within whatever healthcare system you are enrolled in is important, and could ultimately save you both time, stress and money. Check out the rest of this toolkit to take the power back and get what you deserve. Only about 4 percent of Americans can speak about health insurance terms, and about two thirds of American households are under-insured. Insurance companies are difficult to understand, even for experts who study their policies, so check to make sure your plan has the things you need and investigate how to make your coverage plan work for you. Call your insurance provider to learn what your health coverage offers you. Do you have an HMO or PPO? Know the difference so that you can make an appointment for a free consultation. First, make sure that doctor takes your insurance provider so you don’t accidentally start getting billed. You can find out if a doctor is part of your insurance network by checking your provider’s website or checking with the office before you go into the consultation. Make a list of the things you want to know and find out perks you can might be eligible for based on your behaviors (flex your power). Ask your company’s HR or check with your insurance provider if you have any questions at all about how your coverage plan works. Empower yourself by knowing what your deductible is and how to get in touch with the right doctors in your network. Start a habit that puts your health first and you in control. Ask questions. Work through your list, ask friends for recommendations, check your insurance card for important numbers and information you might need both for a doctor’s visit or emergency room trip. Check out healthcare.gov for more information or call to ask questions and get answers. Learn the different types of coverage available to you. ap out what you want and what those solutions might look like.Make a plan to stop your gym membership and create a solution that works (at-home workouts, new bike, etc.). Think about what’s best for you and not just the best branding or short-term fix. Simply ask. Find out what your deductible might be. Your deductible is what you owe the doctor’s office after your visit and after the insurance company takes the bill. If you don’t know what your insurance company is, or how your coverage plan works, then check with your employer (if that’s how you receive your insurance). Ask your employer for additional information about your plan, and see if they have any resources or people at the company you can talk to about your options and ways you can best plan ahead for your coverage. In case of an emergency, go straight to the hospital or call 911. It’s important to immediately treat the situation and your insurance company cannot charge you more for going to an emergency room at an out-of-network hospital. Staying “in-network” means that you’re selecting a doctor from your insurance provider and within that plan. Check your insurance card, what numbers are listed on the back? What are you curious about coverage wise? Call those numbers and find out more information, see how you can book an appointment for any of your concerns. Take preventative care to set up a scheduled visit if you haven’t been to the doctor in a long time. Check out this roadmap to health from the U.S. Centers for Medicare & Medicaid. Try printing it out, mapping out what you’re most curious about and get answers to your questions. To enroll in healthcare coverage in the U.S., or to find more information about your current coverage plan, visit healthcare.gov. What are my rights for breastfeeding at work? A federal law makes it mandatory for your employer to give you break time and location to breastfeed. It must be private space, other than a bathroom, where you can express milk. Most hourly and some salaried employees should fall into that category. Talk to your employer. Ask if they have a handbook at your company that you can refer to, see what the policies are around family leave and if breastfeeding is specifically mentioned. If it’s unclear what the policies might be at your job, then you can learn more from the U.S. Breastfeeding Committee at usbreastfeeding.org. Should I have my medical records? Who should have them? Under HIPAA, Health Insurance Portability and Accountability Act of 1996, you have the absolute right to review or receive copies of your medical records. It’s also your right to keep your medical records private. Your doctor’s office should have your records. You can request copies as well. Everyone is really different when it comes to tracking their health records and it’s up to you on your health journey.